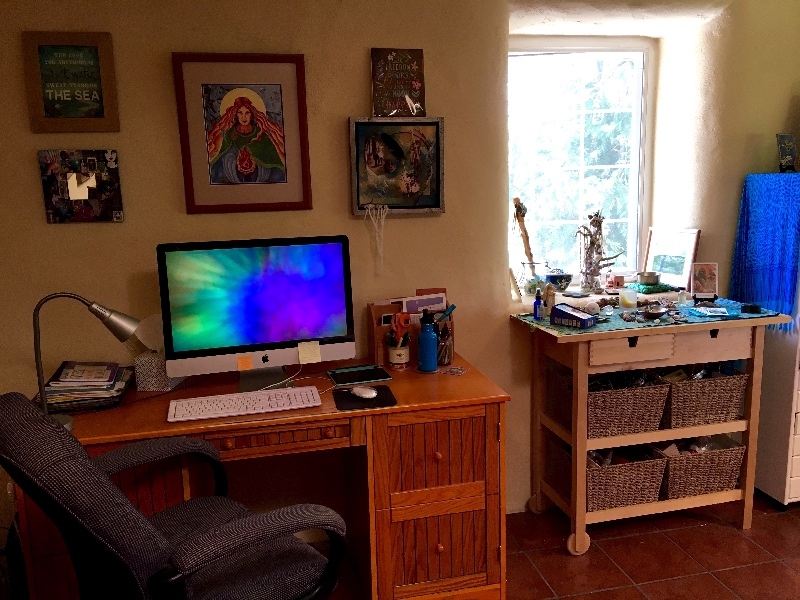 My room at the top of the stairs is part art studio, part office, part writing space, part temple. I love every room in this house — it is a straw bale house that my husband and I designed and built 17 years ago — but this room is the heart for me. When we designed the house, we made sure that we each had our own creative space. His is filled with guitars, drums, and recording equipment. Mine is filled with altars, books, and art. I love the sensual curve of the straw bale walls, painted a warm buttery color that keeps the gray Pacific Northwest winters at bay. I love the terra cotta tiles that remind me of New Mexico. I love the way the light spills in through skylight and windows, indirect in the mornings, full strength in the late afternoons through the southern and western windows. In the winter, I can see sunlight sparkling on the sea through bare tree branches. In the summer, I feel like I’m in a leafy green treehouse. We begin in the East. 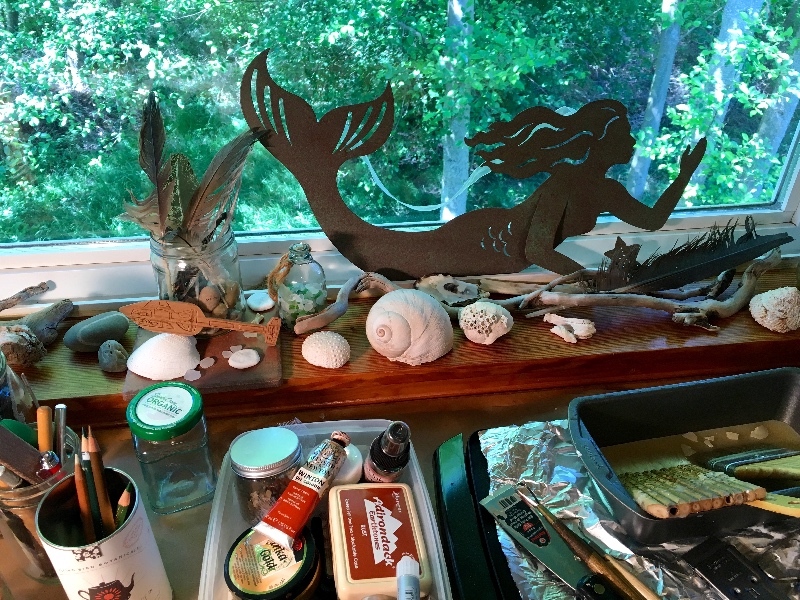 On the eastern wall, I have an altar of beloved objects that I’ve collected here and there, as well as art that I’ve created and art that I’ve bought from artists I admire. Underneath the altar are drawers of office supplies, plus two printers (one archival) and a scanner. 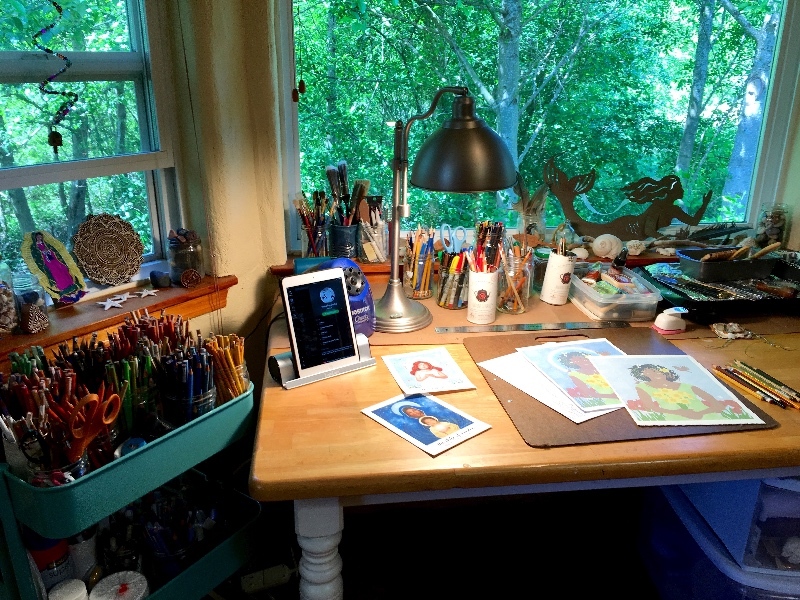 In the South we find my 27” iMac, which is my digital art studio and the hub of my business. 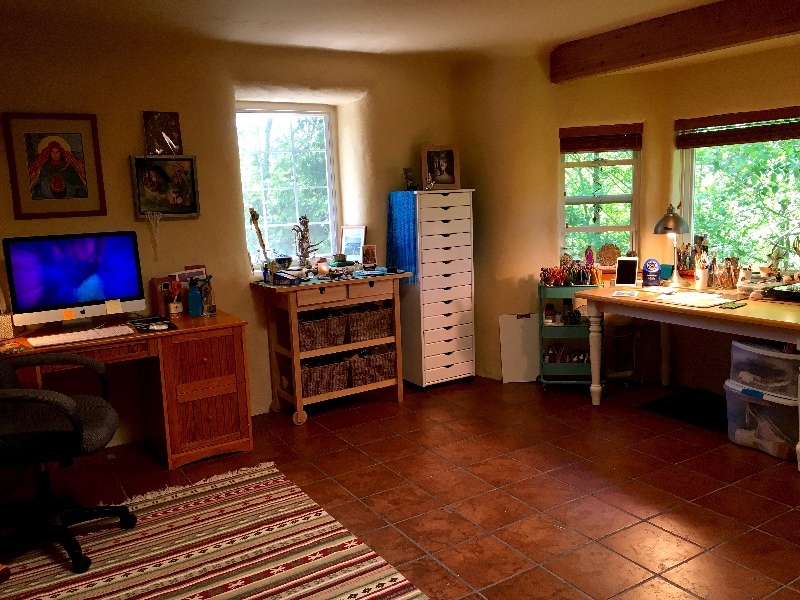 This is where I create my online courses, do website work, and the initial composition work for art pieces. 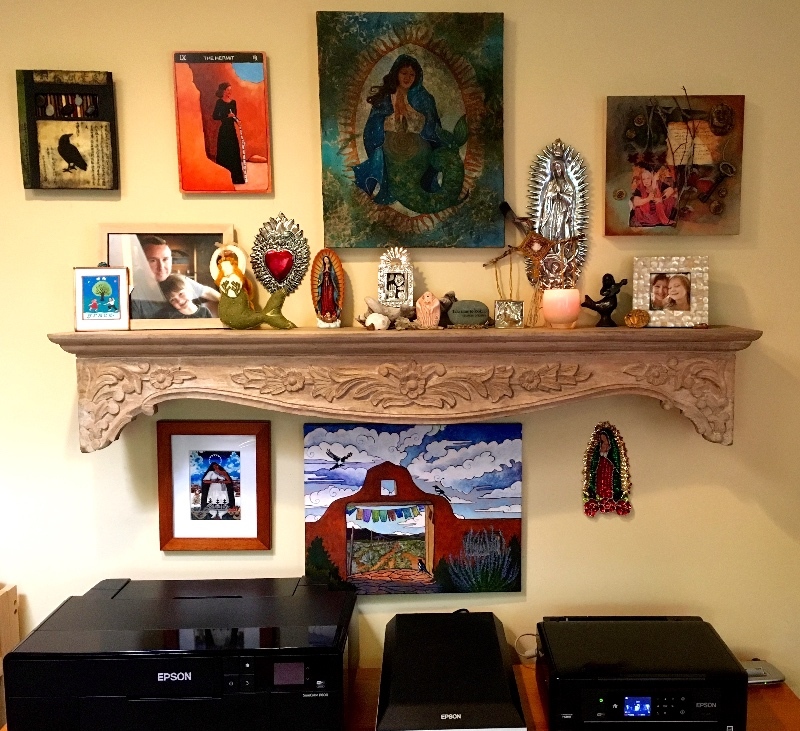 Above the desk is a framed print of my painting Brigid’s Fire: The Offering (I sold the original). I think of her as my creative muse, fanning the flames of creativity in so many different ways. She also reminds me that every work of art — be it visual art, writing, teaching, or ceremony — is an offering to Her. 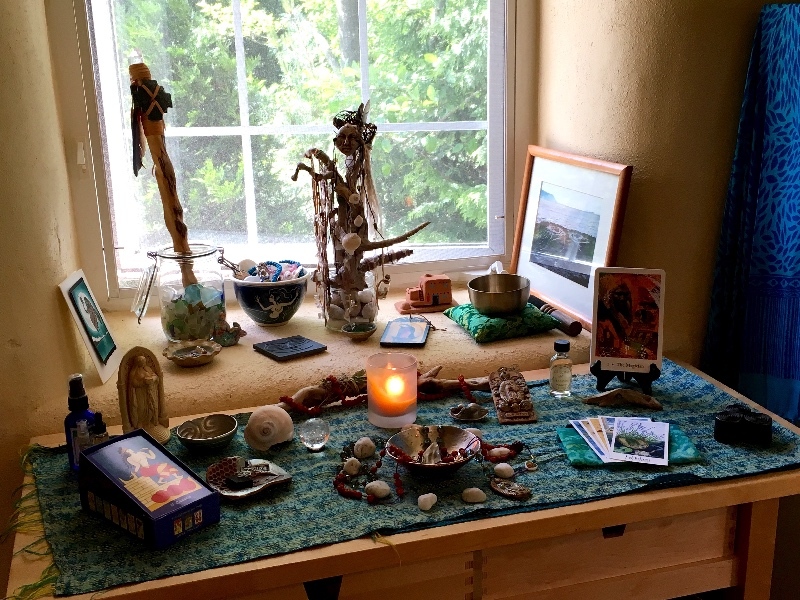 There’s a working altar in the South too, that stretches into the 18” straw bale windowsill. Here is where I do my daily practice. 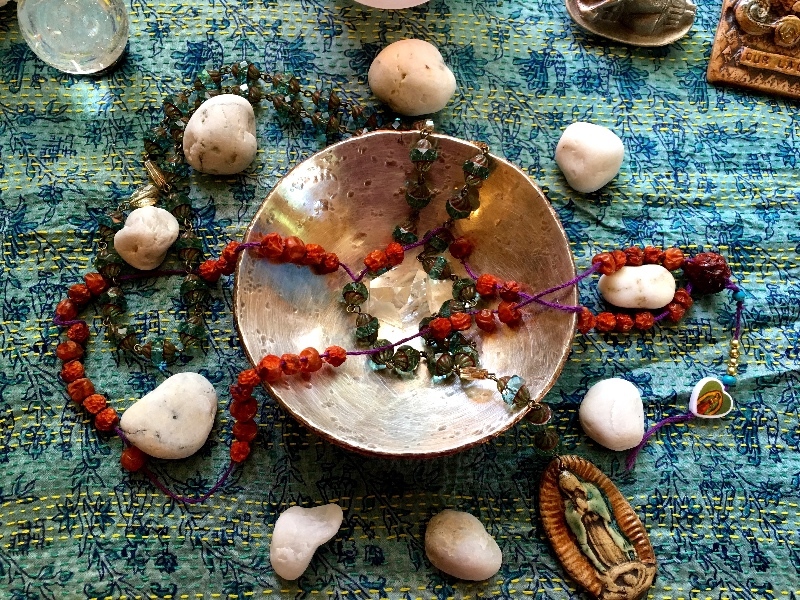 I make offerings of rosewater and copal to the Blessed Mother and use one of my rosary necklaces to say nine rounds of a Goddess rosary. I light a candle and pray for those who are suffering. Sometimes I light a piece of piñon incense (there’s New Mexico again!). I ask for daily wisdom and pull a tarot card for the day. I’m currently working with my own Pentimento Tarot as well as the Minoan Tarot by Ellen Lorenzi-Prince. My art table is found in the West. 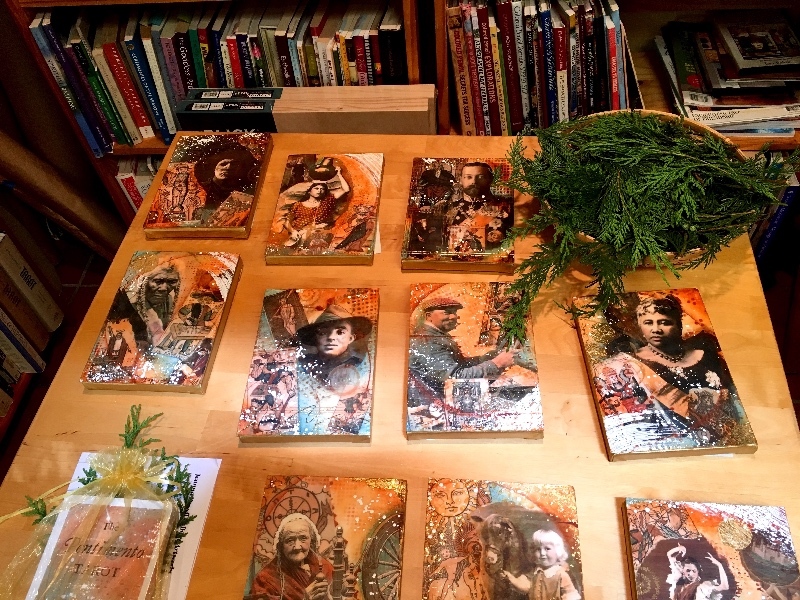 These days I am working in two main mediums — beeswax collage (encaustic) — and colored pencils. I’m also set up for acrylic painting, but that’s taking a back seat these days. This is also the place I often write on my laptop, and it doubles as the packing and shipping table. In the North, we find books. 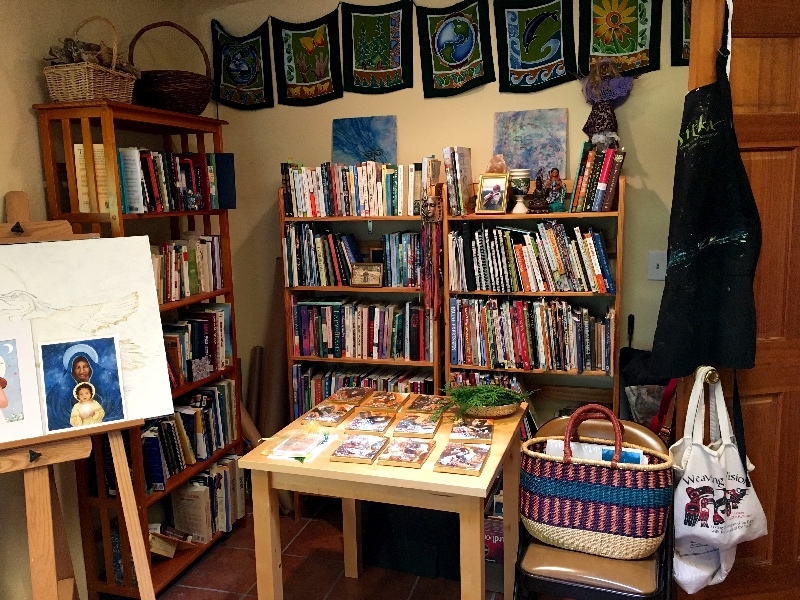 Books on art techniques, books about the Goddess, about nature, about tarot, about writing — my favorite themes. There is also a table here that I try to keep clear. It is often stacked with items that need to be shipped, or pieces of art I’m working on, or finished pieces. It’s a constant challenge to keep this table empty, but I love seeing the potential in a cleared table. In the Center is the dance floor. I love taking dance breaks when I’m doing intense creative work! Outside the four walls of this studio is the rest of our beloved Heron House. 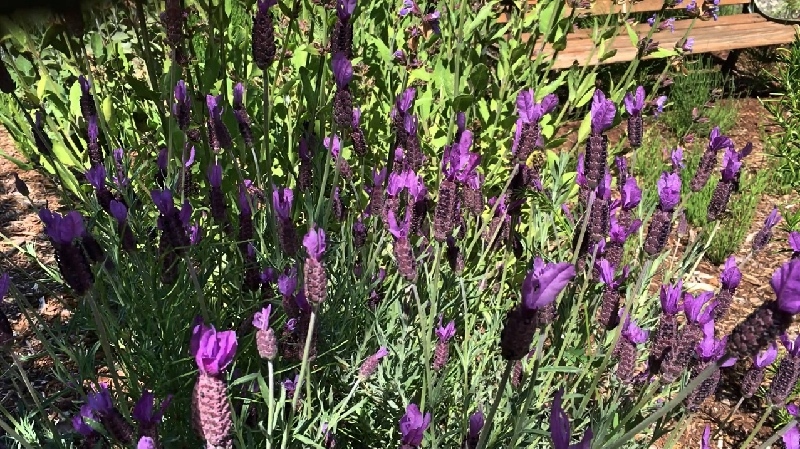 Outside the house, we find my herb garden in the east; the slough where the herons live and the bay where salmon gather, to the south; leafy woods and rocky beach to the west; and the meadow where the wild roses bloom, up the hill to the woods in the north. 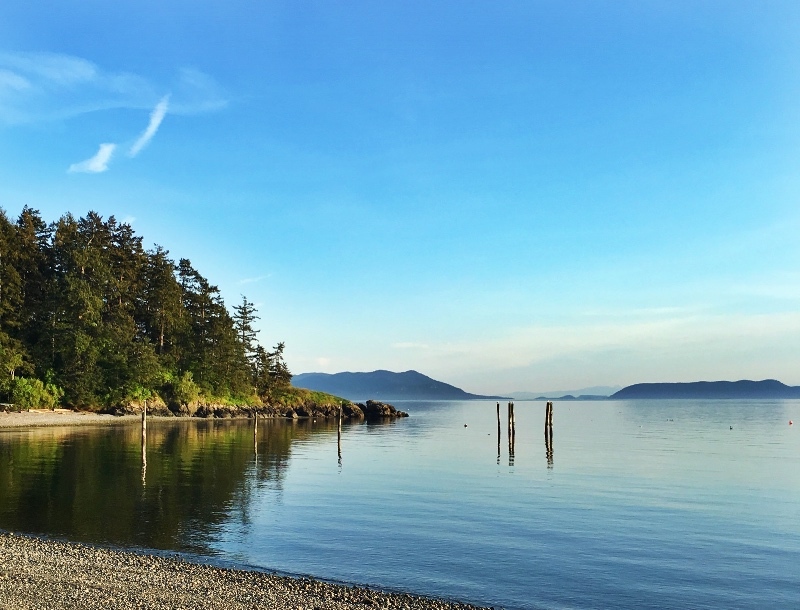 On a wider scale, the city of Bellingham and the great mountain Komo Kulshan (Mt Baker) lay in the East; the islands of the Salish Sea gather round in the South and the West; and beautiful British Columbia lies to the north. We lived here for ten years before moving back to town for six years. We’ve been back for nearly two years now and don’t ever intend to leave again. My creativity has flourished in more ways than I can say since moving back. I am rooted here, in this studio, in this house, on this little island. Not a day goes by that I don’t offer up a prayer of thanksgiving for living here. It’s not something I take for granted. May you also find your heart’s home and be nourished by the creative studio of your dreams. Blessed be. 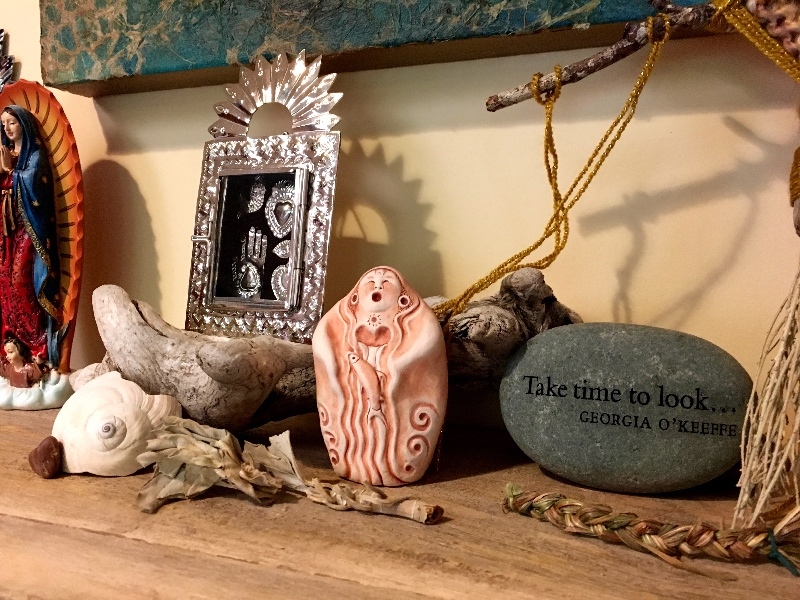 Joanna Powell Colbert is an artist, writer, teacher, and retreat host. 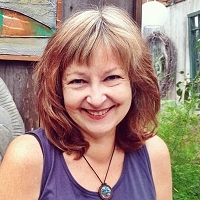 Amber Lotus Publishing Co. calls her one of “the most accomplished and well-loved artists in the Goddess-spirit community.” She was named by SageWoman magazine as one of the Wisdom Keepers of the Goddess Spirituality movement. Joanna teaches e-courses and workshops on earth-centered spirituality, the Divine Feminine, and tarot as a tool for inner guidance and self-exploration. A new edition of her first deck, the beloved Gaian Tarot, will be published in late June. 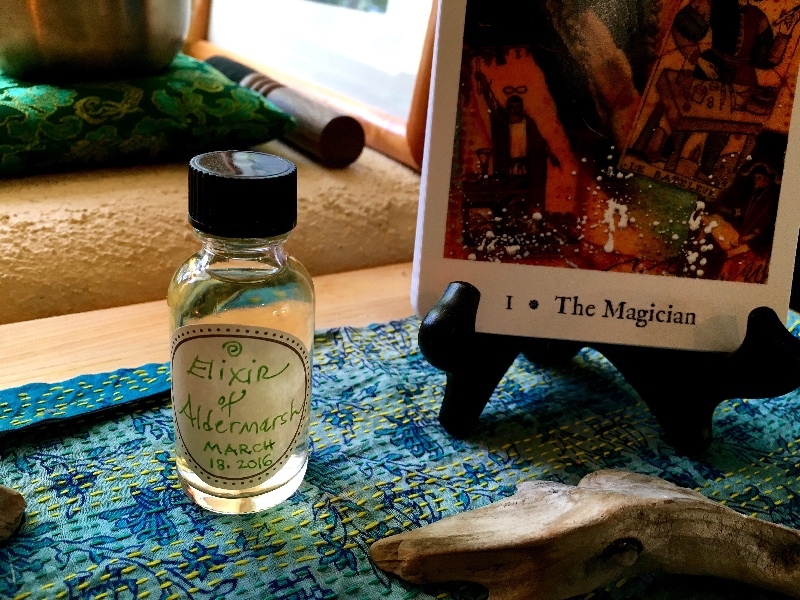 She recently released a majors-only art deck, the Pentimento Tarot and her seasonal e-course “30 Days of Midsummer” begins June 13th. She lives on a small island in the Salish Sea near Bellingham, Washington. Connect with her on Facebook and Instagram.